PRC aid to the Pacific? There is a problem with the People’s Republic of China’s (PRC) aid in the Pacific. It is fragmented, poorly monitored, project-based and contractor-driven, responsive largely to the needs of political elites in the Pacific. The PRC’s newly established State International Development Cooperation Agency is tasked with addressing ‘serious problems’ in its foreign aid program, and conducting more rigorous planning and monitoring. We should not miss the opportunity that this new agency provides for improving PRC aid in the Pacific. Australian companies negotiating agreements with PRC firms should be aware that the PRC’s deleveraging campaign has made it far more difficult for small, private companies to access capital, and many of the avenues through which small firms have been able to borrow in the past are being shut down. The changing credit environment may make it difficult for PRC firms to fulfil agreements. PRC aid in the form of concessional loans is saddling Pacific Island nations with unsustainable levels of external debt. The PRC’s aid program in the Pacific is significant. The Lowy Institute estimates that China is the third largest donor in the Pacific, with 218 projects. While this makes up just over four per cent of PRC development assistance, in some countries—notably Fiji—these projects are the main source of aid, though primarily in the form of concessional loans rather than grants.3 Pacific leaders welcome PRC aid, as it meets pressing political and development needs. For example, Papua New Guinea, the largest nation in the Pacific, met none of the United Nations 2015 Millennium Development Goals, and faces huge challenges in health, education and infrastructure. This is a key feature of PRC aid: while Australian and PRC contractors do compete for business in the Pacific, their aid programs have limited overlap and are complementary. The Belt and Road Initiative (BRI) reinforces the focus of PRC aid on infrastructure and enhancing regional transport and communication links. Many Pacific leaders praise PRC aid for not tying up their bureaucrats in meetings and paperwork, and for the speed of its delivery. There are, however, risks associated with PRC aid in the Pacific. This debt is exacerbated by two factors. 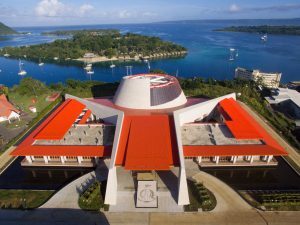 While most loans support productive infrastructure, some have been spent on grandiose projects that offer little return on investment or benefit to ordinary Pacific Islanders, such as oversized convention centres. The loans are also less concessional than the Pacific’s other main sources of debt. While well below market rates, the interest rate is higher and the maturity shorter than World Bank or Asian Development Bank loans. Given the depreciation of the USD against the yuan since the first round of loans in 2006, denomination of loans in yuan has caught out reserve banks in several countries. A second risk is that collusion between PRC infra- structure contractors and Pacific politicians and bureaucrats has led to substandard aid projects and undermined efforts to improve local institutions.6 The limited capacity of the PRC’s fragmented aid bureaucracy and the lack of suitably trained PRC government representatives in-country to monitor aid projects has led to a contractor-driven aid program in the Pacific. For Exim Bank loans, the recipient country must choose an approved PRC contractor, giving companies leverage over the design and scale of aid projects. Exim Bank has only two staff for the entire Pacific, and the now-superseded Department of Foreign Aid in the PRC Ministry of Commerce (MOFCOM) had less than 100 staff for the entire world. In-country, the aid program is supervised by MOFCOM’s Economic Counsellor Offices, but for most Pacific nations, this will only be one or two staff in the embassy, who are also tasked with promoting trade and investment; aid runs a distant third to these priorities. The reputational concerns of Chinese companies based in the Pacific, where poor quality projects can harm their chances of securing future projects from the PRC state, the host government or multilateral agencies. The technical capacity and political influence of Pacific institutions involved in aid delivery, particularly departments of Finance, Treasury and Works. The presence of properly trained and resourced civil engineers to monitor building standards is crucial to the sustainability of PRC (and other) aid in the Pacific. A third risk is that negative perceptions of PRC aid feed existing tensions with Pacific Chinese communities that have led, for example, to racially-tinged riots and evacuations in Solomon Islands, Tonga and Papua New Guinea. Large populations of PRC migrants, who have been moving to the Pacific in search of business opportunities since the 1990s, dominate the retail sectors in most Pacific nations. Although they have no link to Beijing’s aid program and have a largely antagonistic relationship with the PRC state, they are the face of the PRC in the Pacific. Perceptions of favourable treatment for new PRC migrants—the waiving of English language requirements and laws proscribing them from work in the retail sector—feed local concerns of political corruption. The fragmented, contractor-driven nature of PRC aid presents opportunities for the Pacific. Pressure to improve performance and secure more work in the Pacific—including from Australia’s aid program—means PRC contractors are interested in working with Australian state and corporate actors to upgrade their skills and become respected players in the aid sector. Companies such as COVEC PNG and Guangdong Foreign Construction Co. have already adapted to meet Pacific expectations, hiring local workers and using local materials and building standards. Secondly, PRC state actors are more open to cooperation and coordination than in the past. Under the BRI, the PRC’s long-derided Ministry of Foreign Affairs has greater leverage over PRC aid. Recent appointments to the PRC’s key Pacific embassies, such as Ambassador Xue Bing in PNG, point to a higher calibre of representation, with the experience and communication skills to work with other donors. The days of the PRC’s diplomats dozing and playing with their phones during aid coordination meetings look to be over. Australia should welcome a more serious approach to the region from the PRC. Concerns about Australia’s loss of influence in the Pacific are misguided when they focus solely on aid. Australia is the largest donor in the Pacific by a wide margin, with historical ties that the PRC does not have. The Pacific is a low priority for the PRC government, making cooperation and coordination with PRC actors easier than in other regions. We cannot control the PRC’s international actions, but should remember that influence is not a zero-sum game. What we can control is our own attractiveness to Pacific nations. Pacific concerns such as labour mobility and climate change need to be taken more seriously. The Australian government should look to improve the quality of infrastructure in the Pacific by co-funding or cooperating on vital projects with the PRC. Road projects in PNG, where Australia has a strong infrastructure focus, should be a priority. The Australian government should build on the Australia-China-PNG trilateral malaria research project, expanding to other pressing health issues, e.g., multi-drug resistant tuberculosis in PNG, non- communicable diseases in Tonga and Samoa. The Australian government should look to expand cooperation and coordination to areas of overlap with PRC aid, including scholarships, agricultural extension and medical teams. Australian diplomatic missions throughout the Pacific should look to engage with PRC diplomatic staff, and involve them in sector-specific coordination initiatives, particularly in the transport and energy sectors. The Australian and PRC governments should work together in developing practical and scientifically grounded approaches to climate change mitigation and adaptation in the Pacific. DFAT representatives should initiate conversation with Pacific governments and the PRC’s Economic Counsellors on ways to improve the use of aid, with particular attention on the tendering and project design phases. DFAT should develop research projects with PRC organisations that can influence the PRC’s approach to aid in the Pacific, such as the new aid agency, the Chinese Academy of International Trade and Economic Cooperation (CAITEC), and UNDP China. The Australian government should immediately resume Radio Australia’s broadcasting throughout the Pacific and look to support expanded Pacific media coverage. Radio is extremely influential in the Pacific and the PRC is investing heavily in CPC-led ‘soft power’ initiatives. Dr Graeme Smith is a fellow with the Department of Pacific Affairs at the Australian National University. He is known for his research on PRC aid, investment and migration in the South Pacific, and into the changing dynamics of the local state in rural China. He is also the co- host of the Little Red Podcast with Louisa Lim. China Matters does not have an institutional view; the views expressed here are the author’s. China Matters seeks engagement from interested parties to secure the implementation of the policy recommendations specified in this brief. Our goal is to influence government and relevant business, educational and non-governmental sectors on this and other critical policy issues. China Matters Explores is our policy brief series that focuses on individual tough issues in Australia’s relationship with the People’s Republic of China. Our goal is to provide a nuanced assessment of the issue before specifying concrete recommendations to the Australian government, businesses and non-governmental institutions. 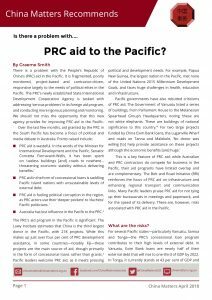 In this policy brief, Dr Graeme Smith addresses the question, ‘Is there a problem with PRC Aid to the Pacific?’, and suggests several measures that could be taken to mitigate the risks associated with foreign aid in the Pacific. Is there a problem with Chinese International Students?, authored by Dr Bates Gill and Ms Linda Jakobson. Is there a problem with Confucius Institutes?, authored by Mr Jackson Kwok. Is there a problem with Australia’s China narrative?, authored by Professor Stephen FitzGerald and Ms Linda Jakobson. Is there a problem with the Quad?, authored by Dr Nick Bisley. Is there a problem with PRC investment in Australian agriculture?, authored by Ms Camille Boullenois. Is there a problem with the PRC’s debt?, authored by Mr Dinny McMahon. Is there a problem with Australia’s South China Sea policy?, authored by Dr Andrew Chubb. Is there a problem with Australia’s research collaboration with the PRC?, authored by Mr Jeremy Stevens. Is there a problem with Australia’s approach to human rights in the PRC?, authored by Professor Jocelyn Chey. Is there a problem with Australian media coverage of the PRC?, authored by Mr Rowan Callick.